Historical 30th & Fern represents two distinct episodes in San Diego history, both of which fall into the 1912 to 1955 time frame. The first is the development phase when wealthy and powerful visionaries collaborated to develop the supportive infrastructure of a trolley, fire station, and automotive garage to serve the future residents of East San Diego. The second is social history phase in which the Rose Grocery and Munter and Munter Gas Station (just south, at the corner of 30th and Ivy) developed in the 1920s as a key commercial node to serve the surrounding community. In 1912, the business relationship between San Diego/Los Angeles builder Max Winter and developer John D. Spreckels represents the key episode of history at 30th Street and Ivy. Winter and Spreckels networked many business deals and were members of integral social organizations such as the San Diego Rowing Club, to which both belonged at the time. To obtain fire insurance for the subdivisions, Spreckels had to get the City of San Diego to build Fire Station No. 9. Winter built Burlingame Garage to service the growing number of private automobiles. 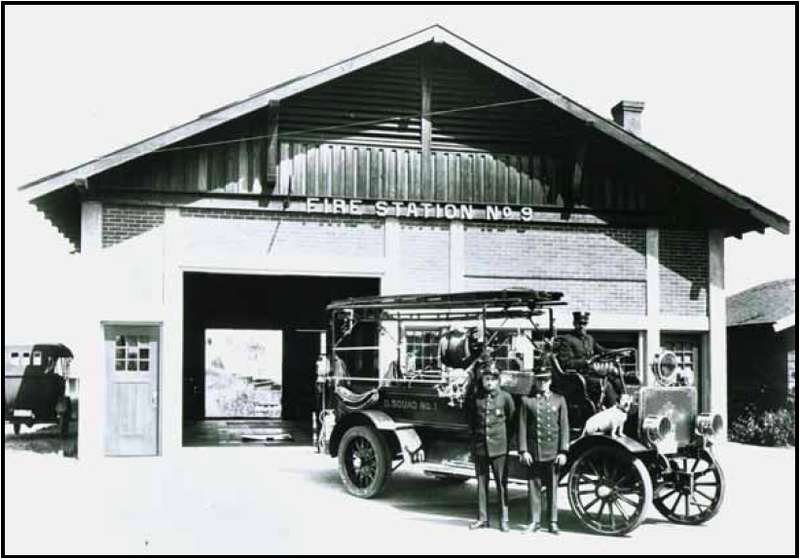 The fire station and garage enabled real estate development and automotive service in this remote eastern extension of San Diego in the 1912-1914 era, just before the 1915-1916 Panama-California Exposition. Both men went on to profit from housing subdivisions in the area. The 30th Street to Fern kink in the rail line served as a logical step-off for pedestrians to shop or step-on after leaving their car in storage or for repairs. By the 1920s, the Burlingame Garage and Munter and Munter Gas Station served the growing residential population of the community. Winter went on to achieve local fame as the builder who interpreted master architect Hazel Wood Waterman’s Children’s Home in Balboa Park in 1925. This beautiful work gave Winter the status as a master builder in the City of San Diego. His biography has been published in several early histories of San Diego. Fire Chief Louis Almgren, also a member of the San Diego Rowing Club, arranged with Spreckels to sell the lot at 2211 30th Street to the City of San Diego for construction of Fire Station No. 9. Almgren selected Craftsman style architecture in keeping with the surrounding emerging residential community and dedicated it in January 1913. Fire Station No. 9 is associated with Fire Chiefs C.R. Lambert, V.F. McClure, and L.L. Johnson, all of whom served Chief Almgren in fighting the famous 1913 Chevron Fire. All of these men are important to the City of San Diego, Fire Department history, and the social development of the district. The next historical phase occurred nine years after 30th Street, Ivy, and Fern formed as a transit stop and automotive repair center for East San Diego. George and Ada Rose invested their life savings to buy the lot and build Rose Grocery in 1923. This family- owned business served the grocery needs of local South Park residents. In 1925, Munter & Munter built and opened their gas station. At that time, Ray Hyman and Orion Zink operated Burlingame Garage. The Roses, Hyman, Zink, and Munters provided essential commercial and transportation-related services that helped serve the needs of this South Park Commercial Center in those early years. In terms of architecture, the 1914 Burlingame Garage and 1923 Rose Grocery are excellent early examples of Mission Revival commercial style from the period leading up to and following the Panama-California Expo. Commercial architecture of this period focused on a flat front elevation with large doors open to the public and the defining architectural elements were placed along the top parapet. Fire Station No. 9, the oldest surviving fire station in the history of the San Diego Fire Department, is the sole surviving example of Craftsman style fire stations and it is almost exactly the way it was built in 1914. There were only two Craftsman-style fire stations and Fire Station No. 8 on Goldfinch was demolished in the 1960s. Historical 30th & Fern embodies distinctive architectural elements that retain their integrity of location, design, setting, materials, and workmanship. These buildings reflect the growth of this urban neighborhood and the commercial enterprises that arose to meet the needs of the community.